This is, well, a little bit of fun, I suppose. This is Little Lottie wearing an apron with a mid-century inspired pattern created by me and she is looking very demure. The set is the Pavilion from Daz (with a floor created with Filter Forge) and Little Lottie is a character I got some time back from Daz. She, in fact, comes from an earlier era and I purchased the character rather on a whim but I have to admit that I do like her and the clothes are well made. Originally, as a 1920s or 1930s character, she is wearing bloomers which show below her skirt but this was an effect I didn’t want so I am afraid I have removed her bloomers to make her more mid-century! I had a lot of fun creating both the pattern and the image and I am pleased with the result so I may well use Lottie again. This is not really a 1950s dress material, it was designed as a modern pattern but it does have mid-century undertones. The colours used are from the British Standard palette (canary yellow, fiesta blue, Baltic blue, eau de Nil along with black and white) which shows well how to combine mid-century with modern. The pattern was created in Adobe Illustrator and the image rendered in Daz 4.7 using a Genesis 2 model and my usual seaside set, the dress being the Paige dress (which is 1950s). 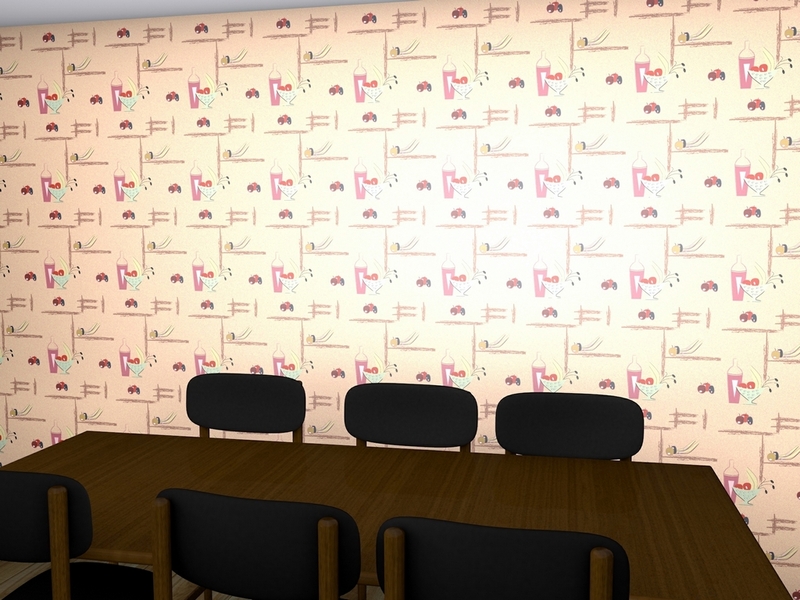 A pleasant and bright kitchen or dining room wallpaper in the style of the 1950s or perhaps into the 1960s. 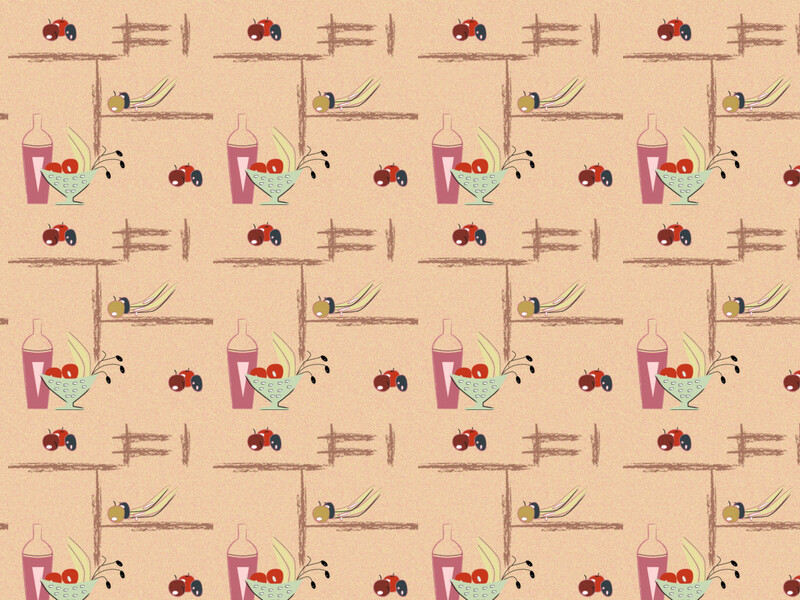 Wallpaper featuring, what were then exotic fruits like aubergines and the garlic cloves, and showing bottles of wine (rarely drunk at at that time in the UK) were popular for both the kitchen, where they were sold in washable papers, and for the dining room area. 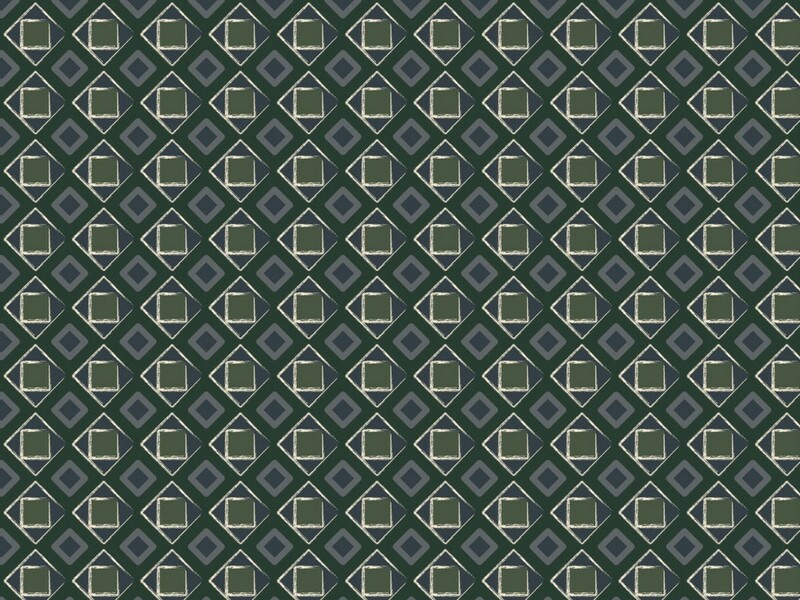 This pattern is styled on several papers of the time and uses, were possible, genuine mid-century colours and motifs. 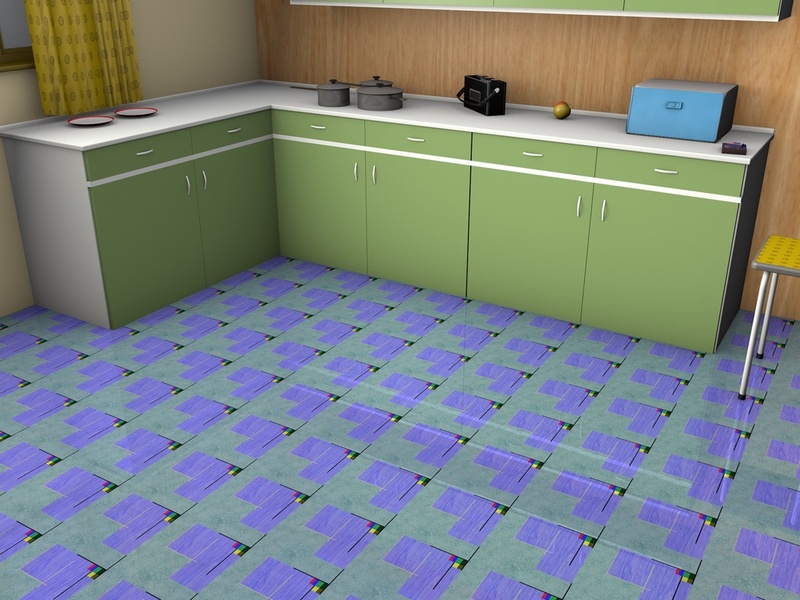 The design was created in Adobe Illustrator and the image produced with Cinema 4D. 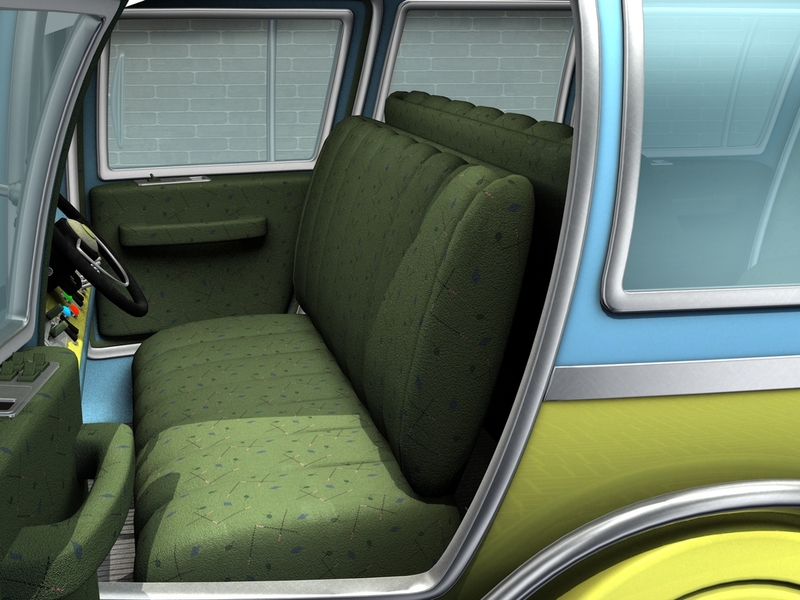 It’s time we had a transportation fabric and this is an excellent, simple, yet highly effective fabric shown as a seat cover. The two colours show quite different looks to the fabric which is deliberately used at a larger scale than I normally use to create the effect. Although not at the forefront of design, I enjoy making transportation fabrics for their own sake. The design was made in Adobe Illustrator and the image created in Daz Studio 4.7 using the Maxis car available from the Daz website. This is a nice lino that looks, and is, very mid-century in a design and colours that were popular then and are still popular today. There is no black, white or red here, the colours used most often in kitchens but this was the second choice for home owners. 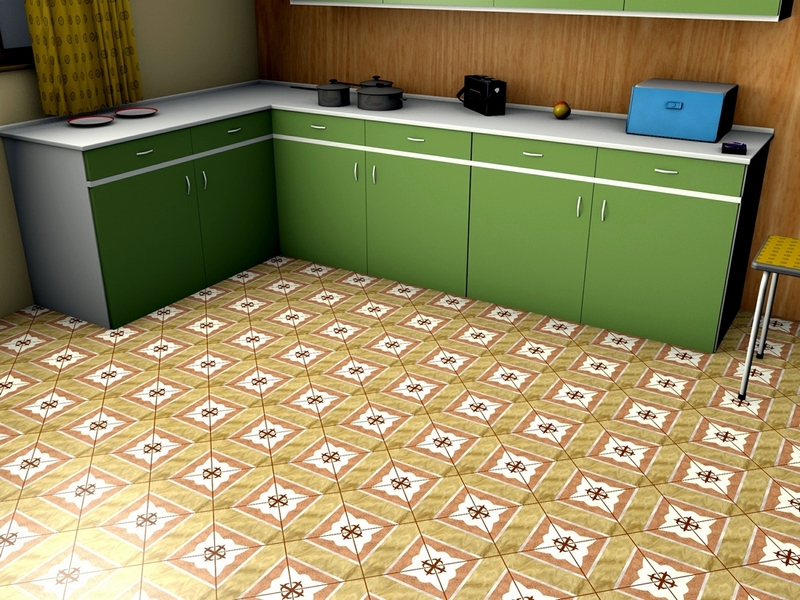 Again, the pattern helps to make the room look as big as possible and to make it easy, the pattern has no particular ‘way’ so, if this were real linoleum, it would be easy to install. Another 1950s style dress fabric but this one is very different to the one I showed recently. Still the pattern is based on very ordinary workaday fabrics but this time it is far less contrasty. The colours, they are British Standard ones, are blue-grey, marble green, Admiralty grey, off-white and pine green, all dark colours but set off by the off-white. 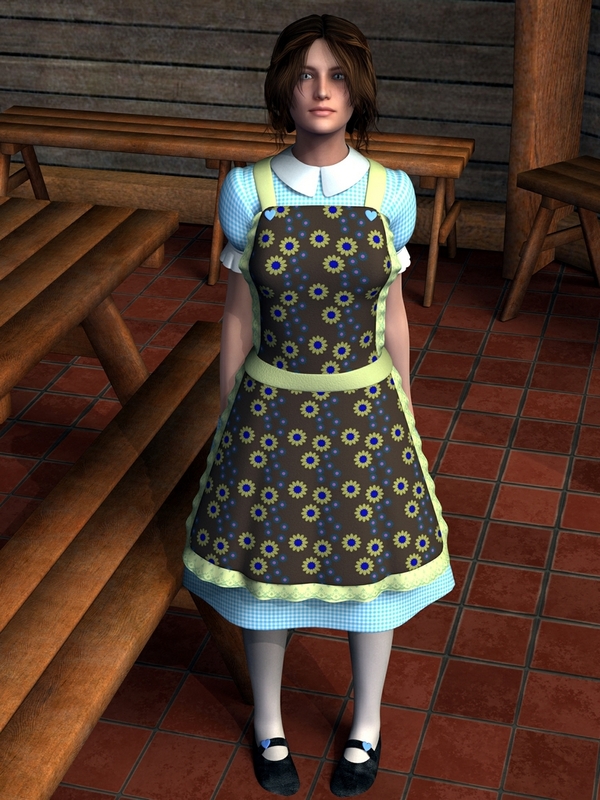 The pattern was created in Adobe Illustrator and the image rendered in Daz 4.7 using a Genesis 2 model and my usual seaside set, the dress being the Paige dress.